Dynamic window graphics will get your message noticed. 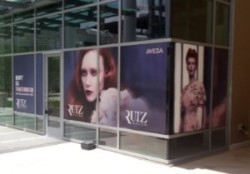 Take a look at our Window Graphics Portfolio here. Low tack, removable pressure-sensitive adhesive bonds well to smooth non-tinted glass surfaces while removing cleanly. Once applied, adhesive adheres well to an exterior glass surface over a wide range of temperatures. Available in short or long term vinyl. Contour cut vinyl comes in a wide variety of colors and last for years indoors and outdoors. It can be applied to windows or to interior walls. Etched glass film is designed to be used in windows and mirrors. It provides the look of real etched glass at a fraction of the cost by eliminating the need for sandblasting and lasts for years. 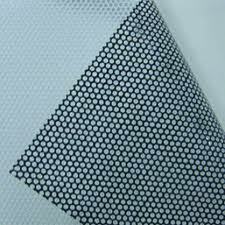 Perforated window film is a high-quality vinyl that allows graphics to be visible from the outside and see through from the inside. It turns glass doors and windows into prime advertising space. Translucent vinyl is an excellent choice when the window is illuminated . Light is diffused evenly to produce vibrant graphics.